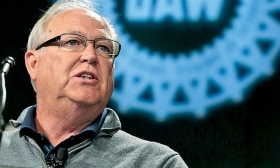 DETROIT -- A changing political climate has created an opportunity to revive the "Buy American" movement of the past, said UAW President Dennis Williams. "I haven't seen it this way for many years," Williams told reporters at a meeting last week. "People now know the impact of an economy that is reckless in trade and policies and how it impacts their lives." The UAW leader said he is "in discussions" to produce advertisements that channel the unrest and encourage U.S. customers to buy union-made cars manufactured in America. "I think there's a movement going on in this country," he said. "I think the American public can push companies into reinvestment in the United States." He said consumers need to be educated about American-made options, especially since not all vehicles from American brands are built here. This month, the UAW criticized General Motors for a Buick ad that features vehicles assembled in South Korea and Poland. To buy American, he said, customers have to do more than visit dealerships of automakers based in the United States. He said they must check the vehicle identification number of the car on the lot to find out where it was built, then check if that assembly plant is unionized. "First and foremost, I want people to buy union vehicles," he said. "Secondary, I'd rather have them buy made in the USA." Trade policy more favorable to the United States eventually will make it easier for consumers to find American-made vehicles, he said. Williams said NAFTA is flawed and has caused investment in Mexico at the expense of American workers. "Corporations have been taking advantage of cheap labour here in North America, which is something, quite frankly, the American people are fed up with," he said. Trump has said he will renegotiate NAFTA and will pull out of the agreement if negotiations fail. At a press conference with Canadian Prime Minister Justin Trudeau on Feb. 13, Trump said he planned merely "tweaking" the trade parameters with Canada and focusing mainly on Mexico. Williams said he has not met with Trump or attempted to contact him, but he plans to set up a meeting with the president to provide UAW input on NAFTA. In the meantime, he said consumer action may be the most powerful tool to direct automaker investment. UAW members have been dissatisfied with government leadership, and that showed in their voting patterns in November, he said. Williams cited an internal UAW survey that showed that while nearly 60 per cent of members voted for Democrat Hillary Clinton and 33 per cent for Republican Trump, an unprecedented eight per cent voted for neither major party candidate. "I think even those who voted for Clinton or Trump had some discomfort with it," he said.